The chefs and sales staff at Thierry Isambert Culinary and Event design are from all around the world. Our Staff Liaison, Catleya Sornmayura, is a key member of our team as she manages the staff schedules for all events. Cat's mother hails from Thailand, so she tries to go back there every year or so. This year she went back by herself, sharing her time between family in Bangkok, Puthamonthon (which is about a 2 hour drive from Bangkok,) and Chiangmai, a 9 hour drive north of Bangkok. She also traveled a few hours north of Chiangmai to Chiang Rai and saw The Golden Triangle, a viewpoint where you can see the connection between Thailand, Laos and Myanmar. Catleya has shared some of her photos and impressions of Thailand with us. "The people are super nice!" Says Catleya, "they try to speak English even though they can't and you're almost better off trying to figure out what they said in Thai." 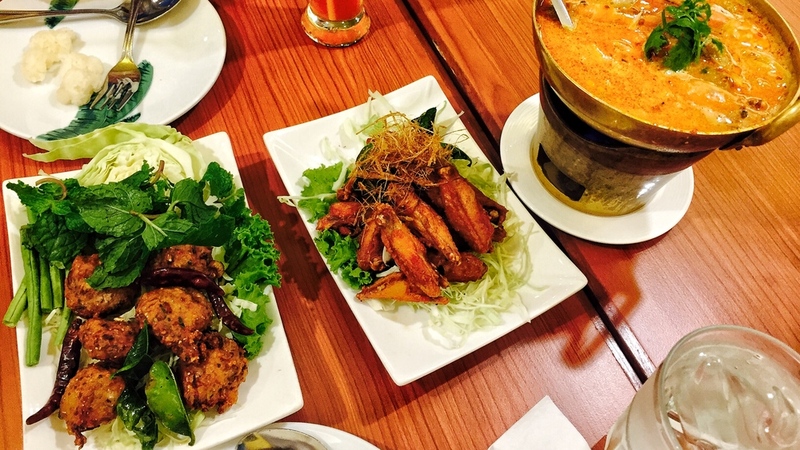 She goes on to say that they love foreigners, and although she does speak Thai, having been raised in the USA, she will always feel like a foreigner there, but that's ok.
"Thai food is typically very flavorful and spicy. You can find food anywhere! I ate so much, literally every hour. Eating is also how people socialize, friends get together to eat out. Most restaurants are local and don't have AC. You can buy most food off a cart in the street or an open area restaurant that just has a ceiling, but no walls. Every meal has to come with rice, and people eat in a sharing manner; you have your bowl of rice and all the entrees are in the middle of the table." Cateleya and her mom enjoyed Kuai Tiao Ruea (Boat Noodles,) at Anusawari Chai or Victory Monument, in Bangkok. These Boat Noodles come in small bowls, and it's often tradition for students in the area to compete with their friends to see who can eat the most bowls of noodles, stacking the bowls up next to them to be counted at the end. "Most people are Buddhist, so there are temples everywhere and people are very patriotic towards the country and king," explained Catleya. Salim (Jelly Noodles) in Coconut Milk. Semi Sweet, served iced. Many thanks to Cat for sharing her journey with us. Happy Summer!